Nvidia has won a bidding war to acquire chipmaker Mellanox for US$6.9bn. Previously both Intel and Microsoft were in the frame for the purchase of Mellanox, a company originally founded in Israel but now based in San Jose, California. Nvidia's bid of $125 per share, which is equivalent to about $6.9bn, is a full billion dollars more than Mellanox was valued at, at close of trading on Friday. The Nvidia-Mellanox deal is a further consolidation in the world of chipmakers. This time the action takes place in the supercomputer / high performance computing (HPC) segment. As well as gaining significant resources from Mellanox, Nvidia's deal keeps these same resources out of the hands of direct competitors like Intel. If you aren't that familiar with Mellanox, its strength is in high-performance interconnect technology. Its network tech is thus installed in "over half of the world's fastest supercomputers and in many leading hyperscale datacenters," boasts new owner Nvidia. 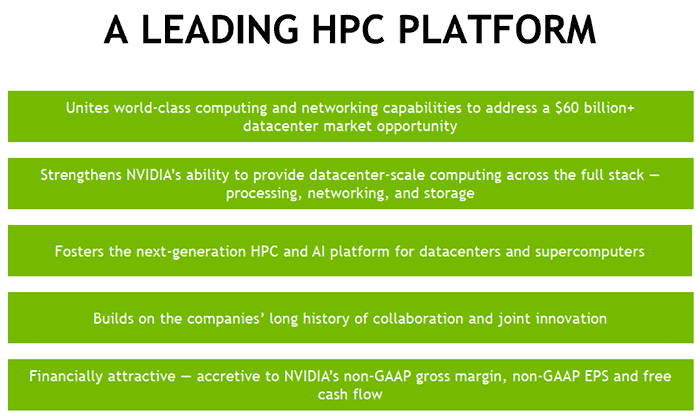 With its ownership of Mellanox, Nvidia hopes to go forward and "optimise datacenter-scale workloads across the entire computing, networking and storage stack to achieve higher performance, greater utilization and lower operating cost for customers." Nvidia and Mellanox aren't strangers; they have previously worked together on several products including the likes of the Nvidia DGX-2, as well as the #1 and #2 US supercomputers - Summit and Sierra. In the press-statement about the acquisition Nvidia's Jensen Huang talked about how excited he was to be able to combine Nvidia's and Mellanox's talents and technologies to create holistic compute/networking architectures "to form a giant datacenter-scale compute engine". Meanwhile Eyal Waldman, founder and CEO of Mellanox talked about how the two companies share the same vision. Waldman added that the combination of Nvidia and Mellanox was "a natural extension of our longstanding partnership". The headlining transaction has already been approved by both companies' boards of directors and is expected to close by the end of calendar year 2019. Nevertheless, the deal has to pass some further regulatory approvals, as well as approval by Mellanox shareholders of the merger agreement, before it is set in stone. But do those supercomputers play Crysis? Im assuing nvidia would be using some of the supercomputer/ datacenter stuff to power their streaming service where you can play crysis, so…. But can it run an AI's that play Crysis while running Crysis?